Ok, I’m a fine dining gal, but I also adore a cheap meal — especially when I spent everything on fois gras and wine all weekend. So, here are two of my favourite spots– so far. The Java House (corner of Augusta and Queen) is undoubtedly a dive, but in the way that you love and respect. You pass the ‘kitchen’ on the way to the downstairs washroom — ladies peeling potatoes sitting on milk crates. But, nothing on the menu is over $10. My friend had grilled cheese and fries; I ate an avocado salad and sipped a giant hot chocolate. Bill: $20. Spicy Thai soup is also full of yums: shrimp, mushrooms, fake crab (mmm fake crab). On Sunday nights, The Cloak & Dagger Pub, again, I’m not promising luxury, serves $3 tacos. Or, $10 for all you can eat and pulled pork no less! Soft or hard shell. (394 College Street). The cool part: music! We were just heading out around 10 pm when some guys started to congregate in the front to play some tunes. 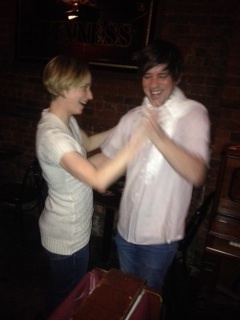 Dagger dancing: my cousin Jodie and I can’t stop swing dancing! Tacos will do that to a girl.